A large-scale analysis in humans reveals that indirect breastfeeding using pumped milk is associated with the depletion of oral bacteria and a higher abundance of potential pathogens compared with direct breastfeeding at the breast. The findings, published February 13 in the journal Cell Host & Microbe, suggest that the milk microbiota is affected by bacteria both from the infant's mouth and from environmental sources such as breast pumps, although future research will be needed to assess the effects that these changes may have on the infant gut microbiome and infant health. "To our knowledge, this is among the largest studies of human milk microbiota performed to date," says senior study author Meghan Azad, a research at Children's Hospital Research Institute of Manitoba and a Canada Research Chair in Developmental Origins of Chronic Disease at the University of Manitoba. "This study considerably expands our understanding of the human milk microbiota and the factors that might influence it. The results will inspire new research about breastfeeding and human milk, especially related to pumping." To address this gap in knowledge, Azad and her collaborators carried out bacterial gene sequencing on milk samples from 393 healthy mothers three to four months after giving birth. They used this information to examine how the milk microbiota composition is affected by maternal factors, early life events, breastfeeding practices, and other milk components. The researchers found a high degree of variability in the milk microbiota across mothers. 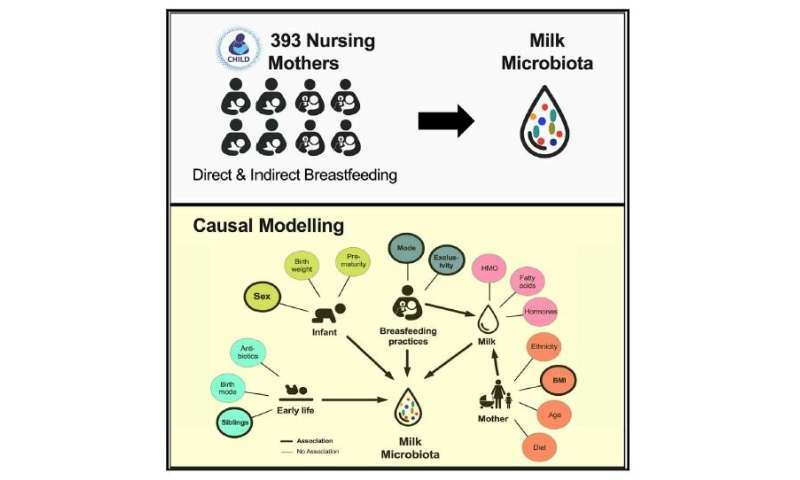 Among the many factors analyzed, the mode of breastfeeding—whether mothers provided milk with or without a pump—was the only consistent factor directly associated with the milk microbiota composition. Specifically, indirect breastfeeding (defined as at least one serving of pumped milk in the preceding two weeks) was associated with a higher abundance of potential opportunistic pathogens, such as Stenotrophomonas and Pseudomonadaceae. "Increased exposure to potential pathogens in breastmilk could pose a risk of respiratory infection in the infant, potentially explaining why infants fed pumped milk are at increased risk for pediatric asthma compared to those fed exclusively at the breast," says first author Shirin Moossavi of the University of Manitoba. To determine if this is the case, there will need to be additional research into how changes in the milk microbiota affect colonization of the infant gut microbiome, which influences health. "Our study contributes new evidence to the ongoing debate regarding the origins of milk microbiota," Azad says. "Contrary or in addition to the hypothesis that milk bacteria come from the mother's gut, our results suggest that the infant's oral bacteria are important in shaping the milk microbiota. Mechanistic studies are needed to confirm this, but if true, it could provide exciting new opportunities for understanding and modifying the milk microbiota." In future studies, the researchers will further explore the composition and function of the milk microbiota. In addition to bacteria, they will profile fungi in the milk samples. They also plan to investigate how the milk microbiota influences both the gut microbiota of infants and infant development and health. Specifically, their projects will examine the association of milk microbiota with infant growth, asthma, and allergies. "This work could have important implications for microbiota-based strategies for early-life prevention of chronic conditions," Azad says.